Did you ‘get’ it? Did you? eh? If you didn’t then it’s probably because you don’t remember the school lessons in basic French. Don’t worry, you’re not alone, … I don’t remember that much about those lessons either. Although I do remember: ‘La plume de ma tante est dans le jardin’. What a useless bit of French was that? How on earth was I going to use that in every day talking? My aunt would never have left her pen in the garden, because if she had, one of her three children would have squirreled it away and produced it in a quiet moment when she wasn’t looking, and the hall walls were ready for a hand drawn masterpiece on them. I’m really honoured, very flattered, and, I admit, a little bit embarrassed, about receiving 3 awards in 3 weeks. And I’m so sorry if I’m boring everyone to pieces with little snippets of ‘me’ all over the place, but I promise that this is the final of the three awards, – so after this you’ll be so full of ‘Cobs’ you won’t want to hear from me for weeks-on-end until you’ve finally filtered all the ‘Cobs’ through your system, past your kidneys and … well you know how your internal system works, so we’ll leave it right there shall we? [nod & a wink]. A blogger who I just adore, The Chicken Grandma nominated me for the Black Cat Blue Sea award. I apparently one of the people who, she said (and I quote) “made me think, they have made me laugh out loud, they have inspired me but most of all they have made me wish I could meet them in person” … Now I have to say that she might have been suffering a moment of ‘delusion’ when it came to nominating me, but she can’t take it away now ’cause I have it in writing! [nods firmly as if to seal the deal]. Thank you Chicken for honouring me in this way. Bless your beautiful heart. Well, the obvious answer is my crafting. Whatever I make will inspire the blog post. However … I don’t just blog about crafts, so, in truth, it’s my life which gives me the inspiration. Things happen, good and not so good, and when they happen I tend to try to look for the either the silver lining, or the humour in the situation, and from that comes the inspiration. I love fun. Not to the exclusion of anything else you understand. But I love the fun which lightens the days. Fun which is harmless to anyone else. You’ll never find me having fun at someone elses expense for example. If there is to be someone who is the brunt of my fun then it’s me. But I’m in my element when I can share the fun with someone else. I have a little handful of bloggers (yes YOU know who YOU are) who have that same little streak of naughtiness running through them. A kind of gentle rascal naughtiness. Something like two girls giggling in the corner of the playground, and no one really knows what they’re giggling about, but everyone DOES know that it’s totally harmless, not offensive or rude and just simply two minds going on a carnival ride together. 2. What do you enjoy most about where you call home? Oh, well that ones easy! ... Mr Cobs, my dog, my cats, my rabbit, and my chickens are all there. Oh … and my craft room is in the garden. umm… Did I mention my craft room? Or as my friend calls it: The ‘executive art annexe’. (Posh friend with just a hint of crazy and an extremely large dash of fun. lol). Oh heck … I have lots of things I love to do .. but I have to tie it down to one … lemme think for a moment ….. hmm.. It seems to be the simple pleasures that I enjoy the most – so I’ll choose ….. Visiting the sea. The sea is just a few minutes away from our home, and I love to visit just to sit and look and watch it. To feel it’s power and yet it’s gentleness. The sound of the sea is a music like no other. Sitting with the sea cleanses my mind and my soul and seems to slow down my pulse and heart rate. It allows me to stop thinking and instead, let another power take control. If you won a prize for a crafty item or craft related ‘goody’ … what would you really want that prize to be … and why? If you were asked to demonstrate how you made a particular thing … for one of the main Craft channels on TV … would you say yes? and .. what item would you demonstrate that you’ve already made? (Give us all a link to that too, so that we can share the enjoyment). You’re going to be stranded on an island all by yourself, for one week. What 5 (only FIVE) crafty items would you take with you? Or ... would you take none and just enjoy the total peace and quiet? And that, as they say, is all there is to it. BUT … if any of the people I’ve named for nomination of this award choose not to accept the award then that’s absolutely fine and groovy. No one is under any obligation to accept the award or to answer the questions. Thank you again to my fabulous Chicken Grandma for nominating me for this award. I’m honoured, and so blessed to know her. Please go and check out her blog (see the link towards the head of this post), and get to know her. She’s an absolute delight and makes me smile so very much. Her blog posts are such an enjoyment to read. Go check her out. 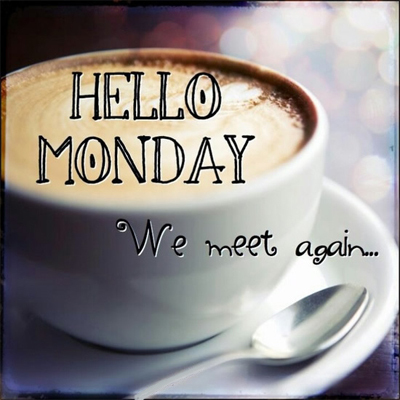 Well today is Monday… So let’s get this week off to a great start, shall we? Could you, do you think, do just one act of random kindness today? Could you perhaps buy a little bunch of flowers and give them to a neighbour, just to make them smile? Perhaps give a sweet card to someone to bring cheer into their life? How about making a cake for someone? Or even buying a pack of biscuits? One of my most favourite things to do where I used to live was something I called ‘Get your neighbour fat day’ … while out shopping I’d buy a couple of cakes from the bakery department and have them packed singularly so that I could take one to one of my lady neighbours, and the other cake to another. I’d sometimes stand on their doorstep singing: “A very happy UnBirthday to you . . . “ (from Alice in Wonderland). Which made them hoot. Go on, give it a go. Do a random act of kindness for someone. You don’t have to spend any money if you can’t… you could pray for the next person who passes you in the street. Or you could simply share a smile. Sometimes it takes the smallest act of kindness to change a persons day, or even their whole life. You really are the greatest bunch of folks, y’know, and if I could give you one thing in life it would be to see yourself through my eyes. Only then would you know how incredibly special you are to me. So .. come on Team! Let’s do it to them before they do it to us! (a kindness that is). Sending you a wish for a truly magnificent Monday. Previous Things I learned this Week . . .
Next BOO! . . . I’m Hare! I will attempt an act of kindness in the morning. Luckily, I’m still firmly in the midst of Sunday night. That gives me a full 12 hours before leaving the house and dropping my “Bah humbug!” mood. Actually sat here laughing out loud. I feel your pain Scrappy, I feel your pain. You’ll over-come, and by the time your feet start out on your journey, you can turn that mood around … with a little determination. Oh, Cobs! “Executive Art Annexe” – what a perfect title for a craft space! And I love your Unbirthday random act of kindness. Please feel free to adopt the UnBirthday RAOK. It’s lots of fun … but you have to remember to sing the song! lol. Have a wonderful day Kathy. Congratulations on your TRIO of awards 🙂 So well deserved as you are genius crafter and also a genius blogger. Wish I could stop by more often than I do. Aw it’s fabulous when ever you drop by Lynne. Thank you for the comment, and for the compliment. Genius? Me? Have you been sniffing the cooking sherry by any chance? Hello beautiful Ruthie, and a very happy Monday to you! Thank you, thank you, thank you. Dear blogging friend you are so kind. I’m thrilled that you too have the sea as one of your favourites. It can be wild and thrashing about … but it still holds the secret to leaving me calm and peace filled. It’s like …. magic! Congrats again! This is getting to be a regular thing I’m thinking.but can’t think of anyone more deserving. Now if I could just figure out how all of you find the time to read all of these wonderful blogs and still blog yourself. Beats me. Ahhh… there’s a trick to it Beverly…. I cloned myself 2 times. Took a LOT of washi tape, pva glue and paper, over 2 individual wire armatures, but the end result wasn’t that bad. Now there are 3 of me! Imagine that. A world with THREE of ME in it! the last one is a blogger. See? It’s easy. All you need is lots wire, reels and reels of washi tape, tons of paper and more pva glue than you could imagine. And then all you have to do is learn to juggle. An Easy Lesson in How to Blog, Craft, Run a House, and be a Super Woman ~ by Cobs. You have to be kidding! I have his MASTERCARD! … … … wanna go shopping? Oh, oh, just buy ANY shoes in a size 3. Craft stuff (obvs), a puppy, and a kitten, a pony, couple of ducks (don’t want them to be lonely). And snacks. YOU GOT IT! I told Amazon to deliver them all on a 24 hour delivery. Everything is coming TOMORROW! Excellent, thanks! Any chance of a second home to store it all in? What kind of puppy? Are the ducks house trained? Will Riley like the kitten? Have I thought this through…. TOO LATE! I’ve had the notification from Amazon woman. They’re all coming by Hermes (another woman) tomorrow. I’m seeing a pattern here. Women are taking over the world. We have a woman PM. America may have their first Woman Pres … and we’re taking over blogland. Yup … definitely seeing a pattern. Ducks can’t be house trained. British Bulldog Puppy. Riley will like the kitten after the kitten has learnt that Riley is BOSS. No you haven’t thought it through. No you can’t have a second home. Have a wonderful day tomorrow, explaining the new additions to the family to Mr. Puff. LOL… Edna (one of my chickens) is having a moult … so it’s all mud and feathers here too. See what a close and psychotic bond we have? I do have to agree with Kathy D….I love the name Executive Art Annexe. It sounds so posh. I am going to have to journey over to the bloggers you chose and check them out. You have a great day (or night) depending what time it is in your part of the world :). I’m not totally sure about our time differences between you and I because you have ‘zones’ of time in your country and we only have one time for the whole of Great Britain. I think Mr. Google might be your friend for working out the difference. LOL. I did google!! Looks like when it is 12 noon here it is 6 at night by you :). I did not even try to guess LOL. I would have guessed 12 hours difference. I think because the only time I have ever been to Europe we were on a plane for 12 hours (I think—-it was a long time ago). I knew you were ahead of us because your posts would say a day ahead of me at times…..and that thought really messes with my brain. (cause it is old and tires easily.) Thank heaven for google. I get confused with all the various time zones – and then sometimes I can forget where in the world someone actually lives so that makes things even more difficult when I’m trying to figure the time here-v-where they are. It takes very little to melt my brain cell. lol. Mr. Google comes in handy for SO many things that I don’t think I could do without him now. Cups (in cookery measurements) turned into weight measurements (which is what we use here). Telephone codes. Spelling – British-v-American. Times here turned into times in places around the world (so that I don’t call someone in the middle of their night, when it’s daytime where I am). Even names for things: Aubergine here in UK is Egg Plant in the USA & Australia. Courgette here in the UK, Zucchini in America. Oh, and so much more. I whole heartedly agree with you – Thank Heaven for Google! Aw love to ‘see’ you Chicken … it brings you closer to where I am and vice-versa.